Sony headphones, they've always been acclaimed and coveted through the years, but when it comes to wireless sets, the saturation we see in the market makes it difficult for them to constantly stay head above water. In this newfound "truly wireless" segment, though, it still remains unseen as to who'll be the leading charge. Sony is banking for its new WF-1000X Wireless Noise-Cancelling Headphones to make some sort of meaningful headway, in a sprawling landscape that already has an abundance of offerings covering the gamut. The design of the Sony WF-1000X is rather peculiar, just because they strike a balance between casual and sport, but they never seem to really satisfy either. 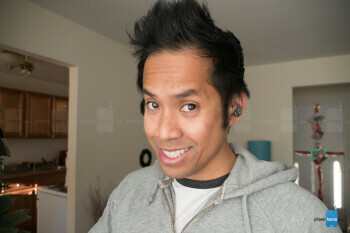 On one hand, the faux metal-polished finish appears a bit tacky, but the snug feel of the silicone ear tips combined with those winged hooks definitely allow them to firmly stay put in the ear – especially during exercises or workouts that involve a ton of movement. Then again, they lack a water and sweat resistant construction that you would kind of expect to get from something like this. 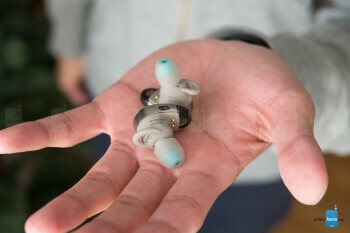 Thankfully, there's no worrying about whether or not they'll fit in your ears. 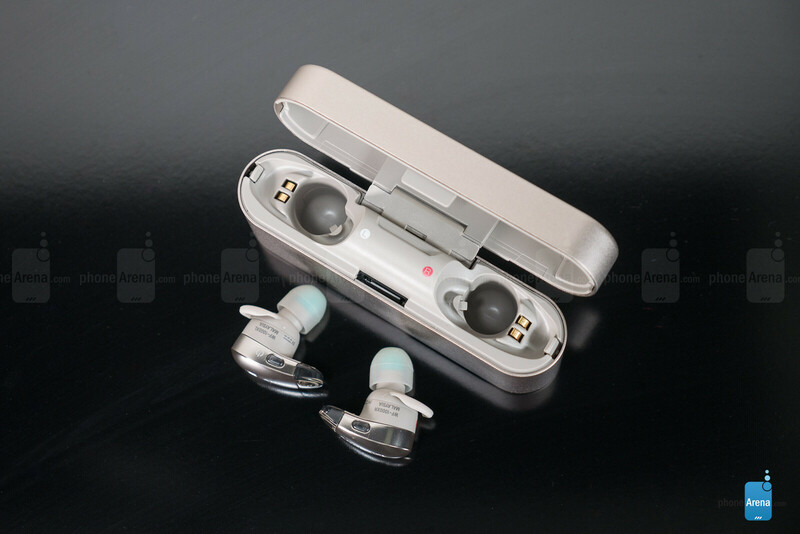 That's because they come included with an army of different sized hybrid silicone rubber earbuds and those fitted winged hooks, as well as another set of these firmer triple-comfort earbuds. They do a fantastic job at suppressing background noise, ensuring that you won't be distracted and your focus will be solely on the music. What's different about the design is the translucent portion of the headphones that jut out a little bit. Giving it a slightly more oblong shape, this translucent section actually houses LEDs that light up red when they're charging in the case – or blue when the buttons on either earbud are pressed. Now, it would've been neat if these LEDs were able to remain on, which would be useful for illumination when running in the dark. Sony's designs are often meticulous and practical, but when looking at the included charging case that comes with the WF-1000X, it'll make anyone scratch their head wondering what happened. 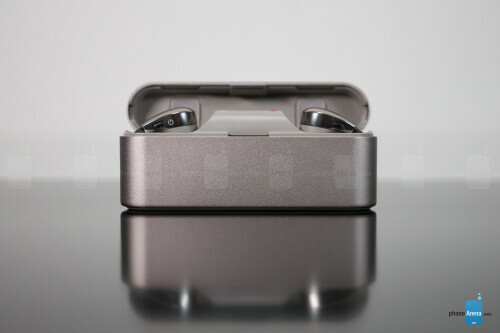 For starters, it looks extremely clunky in comparison to other cases – evident in how there's no magnetic connection to pull in the earbuds into place. Instead, we're forced to snap them into place until they're cradled properly. 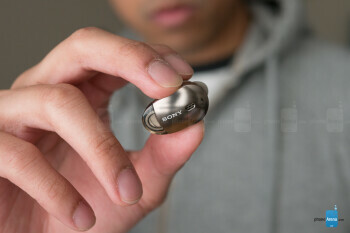 Before turning on the Sony WF-1000X for the very first time, it's recommended to download and install the Sony Headphones Connect app for Android or iOS. In our case, we paired the headphones with an LG V30. After getting them connected, we were instantly informed about a new firmware update available for the headphones – so we updated it to version 1.0.7. 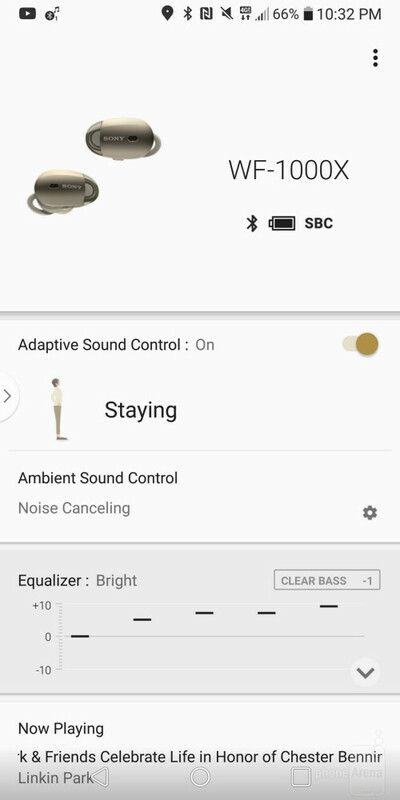 The Sony Headphone Connect app is complementary to how the headphones are used, providing users with a wealth of tools and features to enhance the overall experience. For starters, we greatly appreciate how there are predefined equalizer settings to choose from – offering greater audio fidelity. 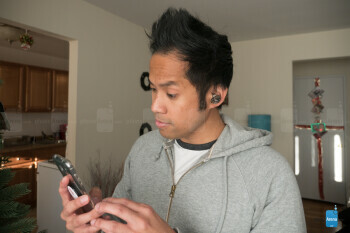 However, unlike the Jaybird app, there's no way to really customize the sound to your specific liking. Additionally, the app provides relevant information like its battery life, volume control, sound quality mode, and adjustments for its adaptive sound controls. The latter is especially unique because the "sense engine" will detect automatically whatever you're doing and adjust ambient sounds accordingly. Take for example "walking" mode, which will boost ambient noise around you to enter the earbuds so you'll be aware of your surroundings – while still listening to music on the go. With the latest firmware update installed, we didn't see the kind of fade ins-and-outs we've experienced on some other true wireless headphones – so it's a relief to know that streaming music will be uninterrupted. In terms of its range, it might've fallen just a little bit short of its rating of 30 feet, but at 25 feet, it's pretty much in the range of most other headphones in its class. 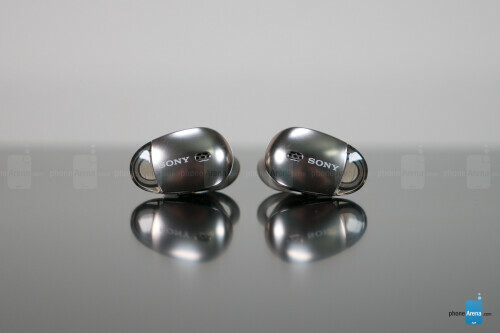 Honestly, the Sony WF-1000X could've been the perfect pair of truly wireless headphones we've come across, but given that there are latency issues that cause audio to be delayed when watching videos, it prevents this otherwise perfect pair from truly being perfect. Most of the Sony WF-1000X’s media playback controls are accessed through the Sony Headphones Connect app, which regulates the volume, equalizer settings, and track forward/reverse functions. 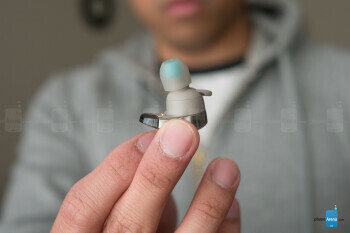 However, each barbud features a miniscule sized physical button on its underside. With the right earbud, it's used to act as the pause/play function – while the left one is used to cycle through its ambient sound controls. Being exposed to a variety of equalizer settings through the app is beneficial, seeing that you can choose what best suits your ear. Even with it off, the Sony WF-1000X's audio quality has a neutral balance that doesn't lean too heavily on one particular audio range – so the lows, mids, and highs are all well-represented. If there's just one complaint we have with the performance, it has to be that it struggles with the lows, even when selecting the "bass boost" option. Enabling noise-cancellation, we're happy to report that it does a phenomenal job in neutralizing background noise. It's so good that we were unable to hear the incoming _phone_ call ringing from a _phone_ in an adjacent room. 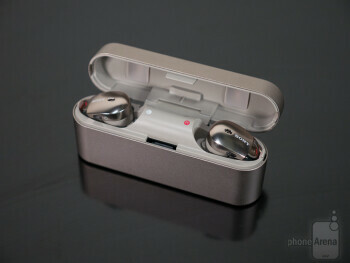 Conversely, too, we find its ambient sound mode especially useful in amplifying voices even while wearing them. Factoring its size and features, we're mostly content with the 2.5 hours of battery life produced from a full-charge. This tally is actually in line to some other more recent offerings, while still significantly better than the first-gen stuff we've seen. Of course, individual results will vary depending on how often you enable noise cancellation. While all of that is fine and dandy, the battery charging case is a bit of a disappointment because it has enough juice to cover another two additional charges, which is considerably shorter than the majority of competition. 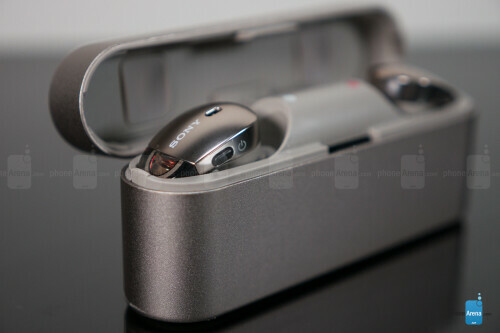 Most retailers that have stock of the Sony WF-1000X are selling them for approximately $180. That figure places it in the premium segment of the market, which is fitting when you consider the fact that it has a few more features that you won't generally find – like noise-cancellation, equalizer settings, and ambient sounds modes. If we're to base it solely on tech, the Sony WF-1000X would earn high remarks for being one of the most features packed truly wireless headphones. Despite all of its offerings, there are still some underwhelming qualities that soften its overall package. In particular, it lacks a water-resistant design, it suffers from the typical latency issue with video, and its battery charging case is clunky. The price alone should cause you to be a bit more judgmental, but if noise-cancellation and the ability to choose equalizer settings are high on your priority list, this is definitely one to think about.